Achieving a proper nasal tip projection is a crucial element of a successful rhinoplasty. A large number of correction methods and manoeuvres have been proposed in the medical literature as solutions for the prominent nasal tip, thus complicating the surgeon’s strife to choose the ideal plan of action. In the present article, a single straight-forward technique, christened the ‘universal retraction suture’, is suggested to tackle the overprojecting tip in a simplified, controlled and efficient fashion. La projection convenable de la pointe du nez est un élément essentiel d’une rhinoplastie réussie. De multiples méthodes et manœuvres de correction ont été proposées dans les publications médicales pour corriger une pointe nasale proéminente, compliquant ainsi le dilemme du chirurgien à choisir le plan d’action idéal. Dans le présent article, une technique simple et directe, appelée structure de rétraction universelle, est suggérée pour corriger une projection excessive de la pointe du nez, d’une manière simple, contrôlée et efficace. A esthetic correction of the overprojecting tip is one of the most difficult and least controllable challenges of rhinoplasty. Numerous related articles (1-18) have appeared in the medical literature, proposing a multitude of corrective techniques, combinations and algorithms. Rather than helping the rhinoplastic surgeon solve the problem of the projecting tip, this avalanche of rules and approaches seems to further complicate the analysis of this highly complex deformity, and tends to render the decision-making process more elusive than ever. The approach presented hereafter proposes the use of a suture technique that may be applied universally to any overprojected nasal tip, and that delivers a predictable and satisfactory result. Nasal tip projection is defined as the distance along a perpendicular line from the vertical facial plane of the profile view to the most anterior point of the nasal tip (1,2). True overprojection of the nasal tip is due to overdevelopment of one or more anatomical components (3). Cases of true overprojection may be caused by a single or multiple etiologies: alar cartilage overdevelopment (probably the most important factor), upper lateral cartilage overdevelopment, dorsal septal hypertrophy, caudal septal hypertrophy, nasal spine overdevelopment, as well as excessive thickness of the tip and supratip skin. Pseudoprojection of the nasal tip, on the other hand, is simply a visual perception of an overprojection (1). Pseudoprojection is an illusion that mostly results from the feeble configuration of other anatomical sites adjacent to the nasal tip, such as a retrodisplaced chin, a saddled nasal dorsum, sunken cheeks, a recessed premaxilla, a sloping forehead, a deep nasofrontal angle, etc. It is important not to confuse the true and pseudo types of nasal tip projection because their treatments are totally different. True overprojection is corrected by practising nasal tip retrodisplacement, while pseudoprojection is treated by enhancing the neighbouring deficient facial features responsible for the perception of tip overprojection. Therefore, the ‘universal retraction suture’ technique for tip retrodisplacement should not be performed on a pseudoprojected nasal tip. Several methods have been described to evaluate tip projection in the profile view (2,4-7). Goode’s (4) accurate and pragmatic technique states that the distance of nasal projection, measured from the alar crease to the tip defining point, should be between 0.5 and 0.67 of the length of the nasal dorsum as measured from the nasal root to the tip defining point. Crumley and Lanser (2) suggested drawing a line first from the nasion to the upper vermilion-cutaneous junction, then dropping a second perpendicular line on it from the tip defining point. He determined that the ideal ratio between the length of the second line and that of the first one should be approximately 0.28. Simons (5) stipulated that the ideal aesthetic proportions of the tip are achieved when the distance between the subnasale and the tip defining point almost equals the one between the subnasale and the superior vermilion border. Finally, the basal view may also be a helpful tool in estimating nasal projection (6). The ideal nostril-lobule relationship should be at a ratio of approximately 2:1. In the case of tip overprojection, the nostril becomes proportionally shorter. The medical literature offers an armamentarium of different surgical techniques addressing nasal tip overprojection. They involve either the weakening of the different tip support mechanisms, or reducing the overdeveloped anatomical components. These approaches may include performing transfixion incisions, lowering the cartilaginous septal angle, shortening the medial and lateral crura, trimming the cephalic portion of the lower lateral cartilages, reducing the dorsum, resecting the alar base, altering the membranous septum, defatting the thickened subcutaneous tissue of the tip skin, etc. An additional ‘perceived’ deprojection could be attained through the augmentation of the deficient nasal and facial components that are adjacent to the nasal tip (3). With so many different methods suggested for the correction of nasal tip projection, it is no wonder that this problem remains confusing to most surgeons, often rendering their choice of treatment an overwhelming pursuit or a guessing game. The universal retraction suture technique has the advantage of solving the surgeon’s dilemma by offering a simple, precise, reliable and, above all, applicable approach to any overprojecting tip. This step is performed first, at the very beginning of the case. The reason for performing a transfixion incision so early is that its recession effect, which is approximately 1.6 mm on average (8), takes at least 5 min to show, much like a new house taking time to settle. This transfixion incision runs along the membranous septum, completely separating the columella from the caudal septal border, and consequently depriving the nasal tip of one of its key supports. Then, to weaken the tip support mechanism even further, the transfixion incision is extended both superiorly and inferiorly. The superior extension of this incision is continued bilaterally as right and left intercartilaginous incisions, between the alar and upper lateral cartilages (similar to the ones commonly performed in closed rhinoplasties). Then, the inferior extension of the transfixion incision continues bilaterally, in a lateral inferior direction, as two incisions running along the floors of the right and left vestibules (Figure 1A). Therefore, the ‘extended’ transfixion incision may be summarized as essentially a vertical line (the transfixion incision along the membranous septum), very similar to the trunk of a palm tree (Figure 1B). Superiorly, this line branches into two convex horizontal lines (the right and left intercartilaginous incisions), like two branches growing from the top of the palm tree. Inferiorly, the transfixion incision divides into two concave horizontal lines (the left and right vestibular incisions), like two roots growing from the bottom of the palm tree. Now that the ‘extended’ transfixion is completed, the rhinoplasty procedure can proceed as usual with the tip alteration and the hump removal. The usual technique needed for the correction of the alar cartilages (eg, resection and reshaping) may now be performed. Resecting or rasping of the hump, as well as performing lateral osteotomies, may now proceed as usual. At this point, it is important for the surgeon to be very conservative in resecting the bony and lower cartilaginous dorsum, knowing that he can always return later to lower them further. This precaution is taken because the final level of the dorsum may only be decided with precision after finalizing the nasal tip projection with the ‘retraction suture’. Using an Adson-Brown forceps, the surgeon catches the columella (Figure 2A) and moves it caudally (downward and posteriorly) until the tip projection is ideal. This manoeuvre gives the surgeon a precise idea of how much retrodisplacement is needed. With the columella pulled down to the desired level (Figure 2B), a marker pen is used to place a ‘dot’ at the midpoint of the ‘pulled’ columella (d1), and another ‘dot’ at the same level on the opposite caudal border of the septum (d2). The columella is then released. A suture is used (semipermanent 3-0 vicryl sutures are preferred) to approximate the two marked dots ‘d1’ and ‘d2’ (Figure 2C). The needle is first passed through and through (skin-medial crura-skin) at the dot ‘d1’ on the columella (Figure 2B and 2C). Then, the needle returns in the opposite direction through and through (mucosa-cartilage-mucosa) at the dot ‘d2’ on the caudal border of the septum (Figure 2B and 2C). 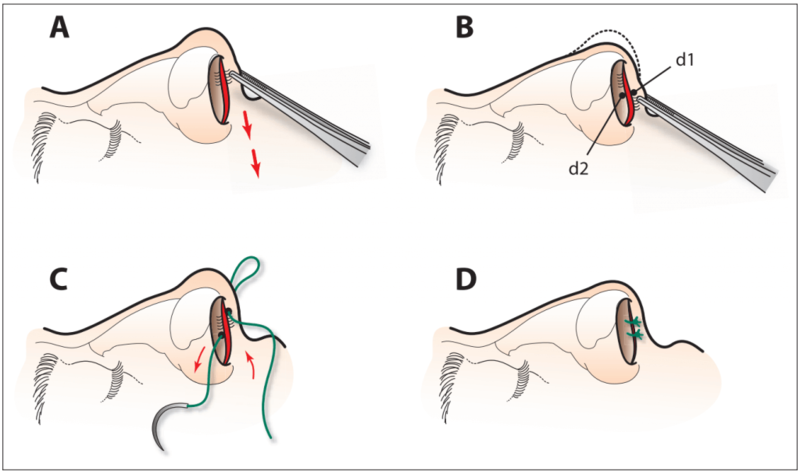 As the suture is tied, the nasal tip moves caudally (inferiorly and posteriorly) to its ideal projection and is fixed in that position (Figure 2D). A second similar suture is then placed through both the caudal septum and columella, above or below the first knot, for further security (Figure 2D). The mucosa and skin edges above and below the two sutures are gently approximated with 5-0 chromic sutures. In approximately two of three instances, retrodisplacing the nasal tip with the universal retraction suture leads to an unaesthetic flaring of the nostrils. In such cases, an alar base reduction, through the excision of a triangular piece of nostril base, is needed to narrow the nostrils. Figure 3 shows the successive surgical steps of the universal retraction suture technique. The universal retraction suture technique was performed on 93 patients by the same surgeon (NF). The patients’ ages ranged from 17 to 33 years, with a mean age of 24.3 years. The follow-up ranged from 11 to 128 months, with an average of 113 months. There were four cases of persistent mild overprojection, which did not need revision and was only noticed by the surgeon, not by the patient. In all cases, the retraction sutures were well hidden inside the nose and fell on their own within the two to three months following the surgery. The results were satisfactory to the patients and the surgeon. Figures 4 to to66 show the pre- and postoperative results of the universal retraction suture technique. Contrary to the previous approaches and manoeuvres described to correct projecting nasal tips, the universal retraction suture is a technique that can be readily applied to all types and degrees of nasal tip overprojection. It has one indication (any projecting tip) and no contraindications. In addition to its universality, the ‘retraction suture’ is simple. The steps are always identical, regardless of the variation among cases. Finally, the technique is very predictable and generates a high satisfaction rate. The universal retraction suture approach to the overprojecting nasal tip can be easily understood and quickly mastered by both the beginner and the seasoned surgeon. It is highly efficient in the deprojection of any nasal tip, whatever its degree of projection. The authors thank Michael Fanous for the literature research and for organizing the manuscript; Ildiko Horvath, medical artist, Montreal General Hospital (Montreal, Quebec), for her assistance in preparing the artwork; Catherine Dalal, administrative assistant, for the typing and proofreading of the manuscript; Minerva Khalife for her photographic contribution; and Barbara Armbruster MA for the editing. 4. Goode R. A method of tip projection measurement. In: Powell S, Humphreys B, editors. Proportion of the Aesthetic Face. Thieme-Stratton; New York: 1984. p. 24. 5. Simons RL. Nasal tip projection, ptosis, and supratip thickening.J Ear Nose Throat. 1982;61:452–5. 9. Safian J. New York: 1935. Corrective Rhinoplastic Surgery. New York.